When long-lived Shelah gets word from her doctor that she is dangerously ill, she refuses to fight it, believing that it is God’s will. When her house near land’s end on the Mississippi Delta starts to leak like a sieve in a rainstorm, she points the finger not at God but at her eldest son, Spencer, who botched the roof repair. And then Shelah’s God starts to really pour it on. 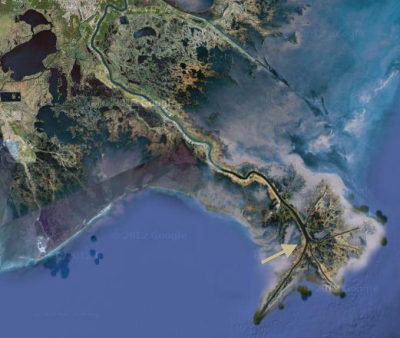 Tarell Alvin McCraney’s new play, set in the distant present, is named after a place of shifting sands called Head of Passes, where the last of the Mississippi splits into three narrow fingers before dissolving into the gulf. It’s also where Shelah’s righteous underpinning is about to sway. 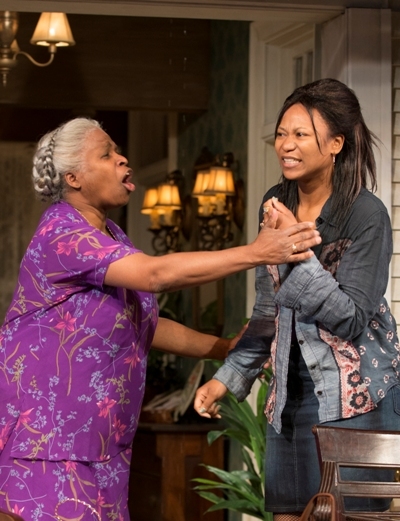 Venerable Chicago actor Cheryl Lynn Bruce is Shelah, who lives somewhat innocently by the Golden Rule, abhors selfish ways, goes to church, chides her squabbling adult children to be kind, scolds anyone who uses the Devil’s name for chocolate cake. All may not be perfect, but Shelah is a respected widow, mother and friend, and she has endured. Then Shelah’s house comes crashing down around her, and that is not a reference solely to the brilliant stage coup at the end of McCraney’s first act that puts you inside quake central. As Shelah is systematically stripped of all that is dear in a catastrophic sequence of indignities that makes her God seem arbitrarily cruel, we meet McCraney’s take on Job in the modern era. McCraney has been a member of Steppenwolf since 2010. Director Tina Landau has been his collaborator on major work since the beginning of his professional career. The ambitious scope of their latest undertaking attests to their deeply sympatico relationship. “Head of Passes” is split into two parts, the first alive with the energy of life as it is lived in this antediluvian rural backwater, the second burning with the solitary anguish of Shelah in her trials. The construction of the play is thus unusual, and although the second half is not as successful theatrically as the first, there is powerfully poetic disquisition in McCraney’s portrait of a madly distracted woman of faith, whose first instinct, by fierce dint of habit, is prayer. 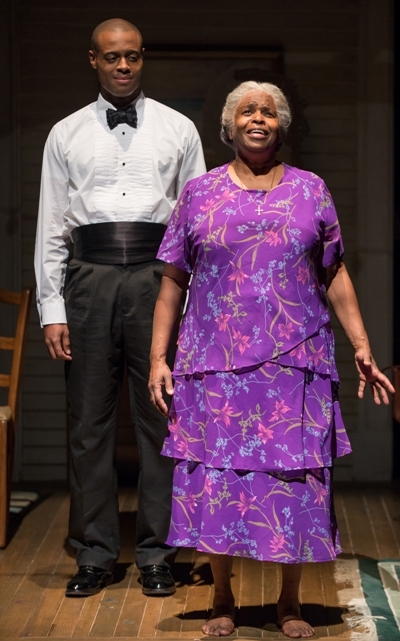 It’s in the first act that we meet Shelah surrounded by her riches — a brilliant mix of individuals in her extended family, sharply etched by McCraney with the most elegant and economical of means. The language of the deep south flows like music here and so does humor. 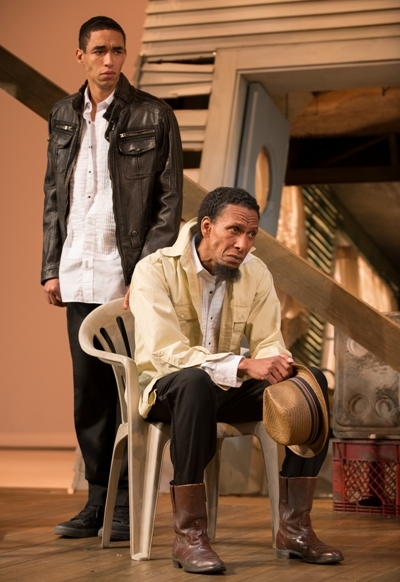 Ron Cephas Jones and Kyle Beltran offer clever cameos as disapproving father Creaker and restive son Crier, going about their duties as hired help for Shelah’s birthday party. 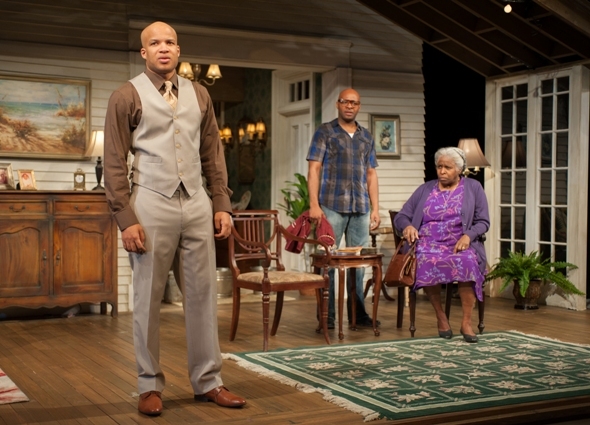 McCraney’s bickersons honor August Wilson in their individuated gusto. Jacqueline Williams is a baudy stitch as Shelah’s best friend, Mae, whose propensity is for partying. Tim Hopper’s a diverting fish out of water as the white doctor in this black parish, long accepted, yet whose goofy opinions are the subject of general bemusement. 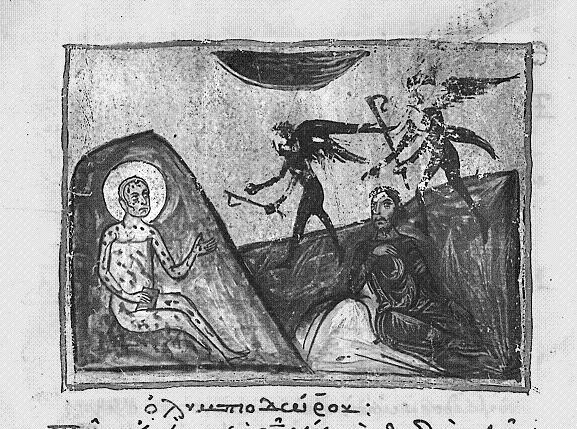 Shelah dotes over them all and resists announcing her grave diagnosis even as she thinks she sees an angel of death (Chris Boykin) hovering. 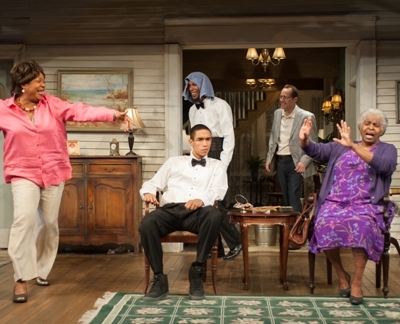 Bruce’s Shelah is warm and authentic, never better than when she tries to make things right with her children, who have worn their childhood roles into cynical grooves — Spencer, the lazy firstborn (James T. Alfred); Aubrey, favored second (Glenn Davis) and Cookie (Alana Arenas), the daughter with pain no amount of drugs will anesthetize. This superb quartet at the family’s core leaves room for laughs, but with Tina Landau’s guidance the underlying tension is always high. 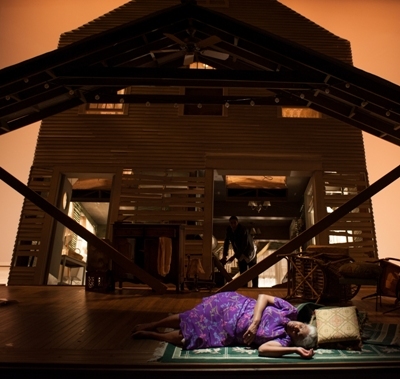 It’s after the collapse of Shelah’s home — David Gallo’s design is a splendid miniature Götterdämmerung — that the family energy dissipates, and with it goes the momentum of the play. Multiple reports of tragedy hit in quick succession, and Bruce is left to shoulder the burden of the narrative almost entirely. She proceeds gamely, but without anyone for her to work against, “Head of Passes” really becomes another play, one that seems almost a meditative portrait of this modern Job’s doubt and disillusion. Something of the original tone returns at the end, however. The Book of Job’s God is an unfathomable divinity who restores his test subject’s earthly riches tenfold after winning a darkly whimsical bet with the Devil. Shelah’s reward is more of the transcendent kind. We just saw the play yesterday and I just wanted to emphasize how important the set design in this play is. To me, it is almost another character in the play at least as far how it symbolizes the assaults on Shelah’s Faith but also how it represents it’s destruction in the second act. The destruction happens right before your eyes at the end of the first act in a way that almost seems like magic. The set is wonderfully professional and makes for a beautiful addition to a powerful play and brilliant acting throughout.